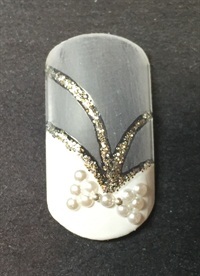 Ryoko Garcia of Bella Day Spa and Salon in Navarre, Fla., shows how to make this bridal shower nail art design. Ryoko Garcia (@nailsbyryoko) of Bella Day Spa and Salon in Navarre, Fla., shows how to shower your bridal clients with this bow design. 1. 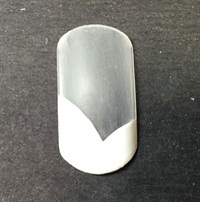 After prepping the nail's surface, apply white gel-polish to create a twisted French. Apply two coats and cure each coat. 2. 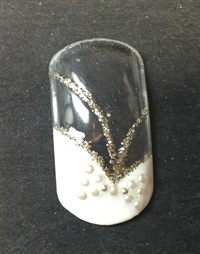 Apply thin lines of silver glitter gel. 3. Add more lines with silver glitter gel and cure. 4. Create bow out of pearls. 5. Apply gel top coat and cure.